I’m from California. 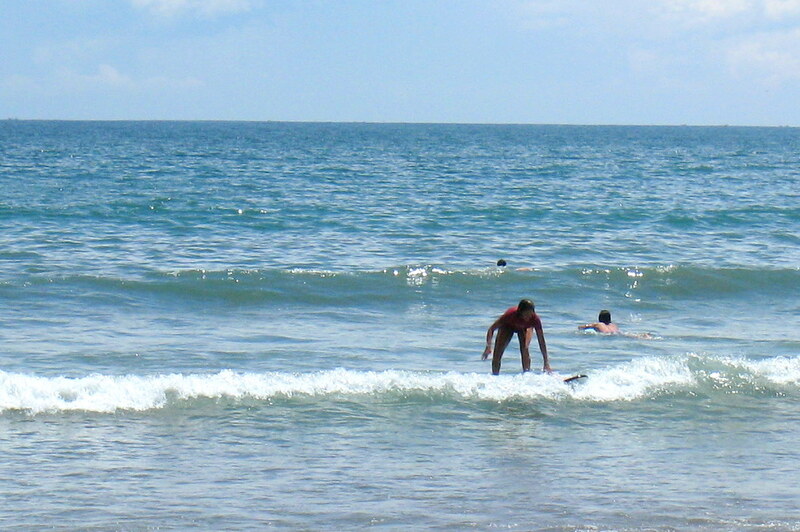 Meaning its pretty much implied that I know how to surf. I’ve tried to learn multiple times, but my stubbornness and fear of being underwater stood in my way. Plus the water in California is freezing and the waves are slightly out of my range. Thus, I made it my mission to finally stand up on a surfboard in Bali. My friend Stephanie, who was only a little bit more experienced than I, and I rented a board for the day on Kuta Beach. She set out first because my nerves were getting the best of me and came back twenty minutes later after being ruled by the small waves, which didn’t give me much confidence. I paddled out, trying to remember what I had been taught six years earlier. Well, it didn’t work because I completely wiped out over and over and over again. Discouraged, I waded out of the water only to find that one of the fins had come off! There is no way that it should have fallen off that fast! I ignored him, he eventually walked away, and we were stuck with a board with only one fin, which didn’t really bother us because we couldn’t stand up anyways. And later that day, after an incident of my shoulder sublexing yet again, I am pleased to say I stood up…for about 2 seconds. But nonetheless, I stood up and a couple days later when we rented a board again, it became a little bit easier. And by a little bit, I mean I still wiped out 75% of the time. I'm so excited that I stood up for the first time! Actually, make that 85%, but I was ok with that. I conquered the waves of Bali! Now onto the icy waters of the Pacific. Hey there, I see your trip is going well. I am another one of those from California that does not know how to surf. Just never lived close enough to the beach to do it. Well I did in college, but there were so many other distractions. This was your first post in quite awhile! It was good to hear you were still out there… and sounds like mostly in the water. By the time you get back the Pacific will be a piece of cake… granted you are also wearing a wet suit 🙂 Maybe in another 10 years with global warming the ocean will be a little better here. I guess there could be a few positives of that, haha. Keep up the writing when you can! Surfing is the one thing I have not tried. I have snowboarded, I have snorkeled, I have sky dived (fell in love with it) and several other things. Surfing is on my to do list, along with a ton of stuff, it’s hard to manage. Keep living the adventure. Growing up in Iowa, you can imagine surfing was not on my list of daily activities. After moving to New Zealand I decided surfing was one thing I definitely wanted to learn how to do. I did it. In Raglan. The waves weren’t big, and I probably didn’t look like surf pro, but I stood up! I surfed! It was a fantastic experience and something I hope to do again soon. I hope to get to SE Asia sooner rather than later … I imagine I’ll give it a try then. Bali seems like the perfect place to learn how to surf. I think it’s a common misconception that most Californians know how to surf – or have at least tried it once. I recently read that just 1 in 4 of all people from California have tried surfing. Anyway, best of luck with your future surfing endeavours! Haha! Love the statistic! So true! I agree. I live in California, one block from the beach, but have only tried surfing three times because (even in the summer) the water is fiercely cold! That being said, almost everyone I know surfs. When I was in Bali a few months ago, there weren’t any waves. Can you believe it? I’ve read countless surf magazines depicting images of idyllic waves in Bali, yet weeks of scooting around the island to well known surf breaks yielded the same result. All flat. No surf. Glad you were able to experience surfing in Indo.